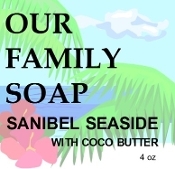 Our classic soap with Coco butter with lure of the beach. Spice, Citrus, Sensual...white sands and sunshine... grap your beach chair! Olive oil, coconut oil, palm oil, lye (sodium hydroxide, necessary for soap making), proprietary blend of essential oils, coco butter and vitamin E.